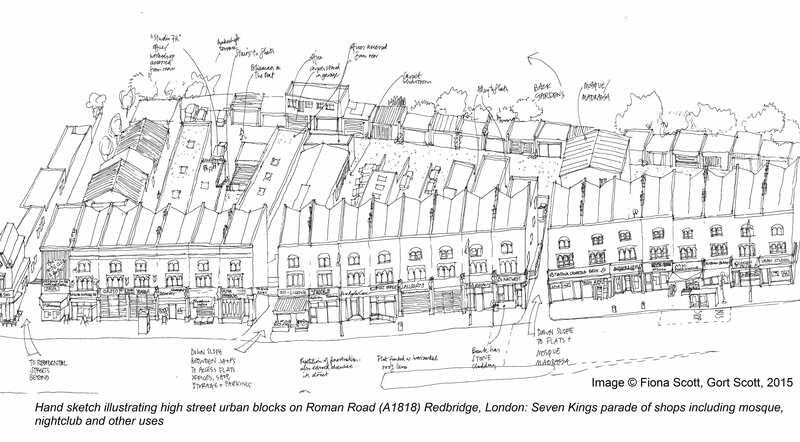 Today’s guest post is by Professor Laura Vaughan, author of Mapping Society (published today), editor of Suburban Urbanities, and Professor of Urban Form and Society at the prestigious Bartlett School of Architecture. The inception of Mapping Society was over quarter of a century ago, whilst sitting in a seminar room at UCL while studying for my Master’s in Advanced Architectural Studies and seeing Charles Booth’s maps of poverty. The period of the early 1990s was a time when Bill Hillier, the founder of the field of space syntax, was developing his conception of the city as a ‘movement economy’. By identifying a phenomenon of ‘marginal separation by linear integration’, Hillier was using the historical map not only as a source of information on how cities worked in the past, but also as source of inspiration for building a broad theory of how cities work in general. A few months after my first introduction to the Booth map I was browsing in the Hebrew and Jewish Studies section of UCL library and came across a fragile book from 1901, with an even more fragile map inside: the map of Jewish East London, 1899. Looking at the way the map, with its shadings of blue from light to dark, was used to accentuate the density of Jewish immigrant settlement in the area, immediately struck me as showing some fundamental spatial regularities beyond simply being a ghetto – as it was known then. In fact, this book reflects two decades of enquiry into the spatial nature of society, with a specific focus on the detailed patterning of social patterns as these are laid out in historical maps. Going beyond placing the data on the map to a deeper analysis of the geographical patterning of the data allows the researcher to pose a variety of questions: regarding the spatial character of the urban setting, regarding whether social data of a single type have spatial characteristics in common, and – in general – to control for spatial effects when analysing social patterns. For me, the Booth maps have become the quintessential starting point when exploring the relationship between the spatial organisation of cities and how societies take shape over time. This book does so by taking maps of social statistics and developing a close reading of the maps themselves as well as the context within which they were created. A side product of this inquiry has been the discovery of the extent to which social cartography is frequently used not only as a tool for communicating information on patterns of settlement, but also for other purposes: for propaganda, to collate evidence or to support scientific argumentation. The use of social maps as an analytical device is less prevalent and this book will show how a reading of the spatial patterns captured by such maps can reveal some fundamental rules about how cities work according to a specifically spatial logic of society. Ultimately this book’s ambition is to demonstrate how an interdisciplinary reading of social maps can provide a richer understanding of how society and urban spatial systems interact with each other. Thus, phenomena such as segregation can only be fully understood once we take account of a wide variety of factors, including economic, political, social as well as spatial context – and all this in addition to the changes that cities and their inhabitants undergo over time. After a short Summer break, we have bumper crop of five titles to see us into the Autumn. Mapping Society is a book we were excited about even before we saw the manuscript. Written by Professor Laura Vaughan (editor of Suburban Urbanities), Mapping Society traces the evolution of social cartography over the past two centuries and takes in everything from a rare map of yellow fever in eighteenth-century New York, to Charles Booth’s famous maps of poverty in nineteenth-century London, an Italian racial zoning map of early twentieth-century Asmara, to a map of wealth disparities in the banlieues of twenty-first-century Paris. The author examines maps of ethnic or religious difference, poverty, and health inequalities, demonstrating how they not only serve as historical records of social enquiry, but also constitute inscriptions of social patterns that have been etched deeply on the surface of cities. The Impact of Migration on Poland asks how the international mobility of Polish citizens has intertwined with other influences to shape society, culture, politics and economics in contemporary Poland. Incredibly topical, this book will be important reading for anyone interested in the influence of migration on society, as well as students and scholars researching EU mobility, migration theory and methodology, and issues facing contemporary Europe. Nanofibres in Drug Delivery aims to outline to new researchers in the field the utility of nanofibres in drug delivery, and to explain to them how to prepare fibres in the laboratory. Finally, we have two additional titles in our urban studies list. The much-requested PDF version of Musical Cities publishes on 17th September, discussing why we should listen to urban rhythms in order to design more liveable and sustainable cities, before demonstrating how we can do so through various acoustic communication techniques. Cities Made of Boundaries presents the theoretical foundation and concepts for a new social scientific urban morphological mapping method, Boundary Line Type (BLT) Mapping. Its vantage is a plea to establish a frame of reference for radically comparative urban studies positioned between geography and archaeology. Based in multidisciplinary social and spatial theory, a critical realist understanding of the boundaries that compose built space is operationalised by a mapping practice utilising Geographical Information Systems (GIS). Today’s excerpt, is from the Editorial Introduction of Arcticness, a multi-contributor volume edited by Ilan Kelman, UCL . People and communities, lives and livelihoods. These define the Arctic, just as with all other populated areas on the planet. Is there, then, anything special, specific, exceptional or unique about the Arctic? To the peoples in the Arctic, the answer is ‘of course’. As Arctic literature is fond of stating, there is no single Arctic. Definitions abound, from being a region or place to being an idea or phenomenon. The Arctic is delineated by latitude, tree lines, national and subnational borders and indigenous territories, among many other suggestions. All these elements vaguely concentrate into the northern areas of Canada, Finland, Norway, Russia and Sweden along with all of Alaska, Greenland and Iceland. This is the Arctic as a place – and the Arctic as place. The Arctic is also characterised, perhaps more so, by its people. Depending on where boundaries are set exactly, the Arctic’s population is anywhere from approximately 4 million to approximately 13 million people. About 10 per cent of Arctic inhabitants are indigenous, belonging to 40 different groups, examples of which are Saami, Inuit, Nenets, Yakuts and Aleuts. In some jurisdictions, such as Nunavut and Greenland, indigenous peoples are the majority. All Arctic areas have comparatively low population density. Arctic indigenous peoples are partly defined by the way in which they were colonised from the south. Iceland is the only Arctic country without designated indigenous peoples. The other seven countries have never fully addressed their post-colonial legacy which included active suppression of indigenous languages and cultures, forcing nomadic peoples to settle, and taking indigenous children away from their families for the purpose of ‘education’ and ‘acculturation’. As part of aiming to re-connect Arctic peoples and places, and to redress past mistakes, each post-colonial Arctic country apart from Russia has, to a large degree, settled land claims with Arctic indigenous peoples. The settlements occurred in different ways and in different time periods, with implementation, monitoring and enforcement still not fully functional in many instances. The generational context adds complexity. The generation of leaders who grew up under colonialism and who negotiated the settlements are now in the process of retiring. They are giving way to a new generation of leaders who did not experience similar difficulties or frontline fights for autonomy and the recognition of indigenous cultures. They face other challenges, such as low educational attainment, high rates of substance use and abuse, and high suicide rates. They are also looking to connect to the world beyond their (mis) governing state through the internet and social media to define and re-define, and to be proud of, their indigeneity, their peoples and their places; that is, their Arctic. The battles are not over. Greenland’s independence is still a possibility. Racism against indigenous peoples remains. The peoples are not homogeneous groups, such as the Saami who have different livelihoods including reindeer herding, fishing, both and neither. Non-indigenous Arctic peoples also represent the Arctic, not just Icelanders but also those born and/or living in the north but without an Arctic indigenous heritage. One class of Arctic peoples, most notably in Scandinavia, comprises immigrants from around the world, including refugees, who fully settled in the Arctic and who are now raising first-generation, Arctic-born families with diverse, international heritages. Within this Arctic rainbow, what is the Arctic? How do Arctic peoples relate to their places? The ways include living, livelihoods, environments and movements. In many locales, movement means the typical commute by private or public transport to a nine-to-five office job. In many locales, it is the typical subsistence hunting, conversing with the wind, feeling the sea, traipsing the land and traversing the ice. Water (solid and liquid) and wind flow, bringing with them life and death. The Arctic peoples flow with them. Movement, survival and thriving are choreographed within the elements and within the colours of the seasons: blue, grey and white melding with brown, green and splashes of colour in summer flora and fauna. The ever-changing kaleidoscope of weather and skies, of animals and oceans, of plants and the Earth, creates Arctic flows and ebbs. Transitions and boundaries are prominent but fuzzy. Snow melds into land shifts to water becomes ice, drifting lazily under the dazzling dome of the summer sun and the scintillating stars of the wild winter. When the ice roads thaw making transport difficult, inland communities are spoken of as being landlocked. When the ocean is too rough for boats and the wind is too dangerous for planes, island communities are seen as being entrapped. What vocabulary suggests being icelocked? The ice can be too thin on the water or too crevassed on the land, or just too slushy everywhere. The transition between seasons can be harsh when the land ice and sea ice mixtures do not permit safe transport. Then, one’s Arctic place becomes evident, as an islander or not, as someone who enjoys being indoors or not. Movement and entrapment mean that Arctic placeness is not contentedly fixed. In any case, the glaciers, the ice, the snow, the water and the wind are always in motion. The rivers and the seas emote ripples and waves. The tides breathe for the water and the wind for the air. Coasts erode and accrete – with both ice and sediment. Arctic changes are expressed in other ways. From colonisation to self-determination, the Saami have created their parliaments, referenda supported autonomy for Greenland and Nunavut, and Russian regions and territories have various levels of self-governance. Exceptionalism identifies many Arctic place traits – including the internationally unique Svalbard Treaty and the central Bering Sea having its ‘donut hole’ which is an enclosed polygon of international waters surrounded by territorial seas. The scale of Arctic territories is sometimes forgotten. From Murmansk to Chukotka, the time difference across Russia is nine hours. Alaska has only two time zones, an artificial construction, but as the largest American state more than twice the area of its nearest rival, it is almost as wide and as tall as the entire contiguous states. Ottawa– Iqaluit flights travel more than three times as far as the London– Edinburgh route and are still shorter than Greenland’s full north–south distance. Current national borders across the Arctic are poorly reflective of indigenous cultures. The Saami are partitioned among four countries. Only modern politics draw a line between Alaska and Yukon. The Canada–Denmark dispute over Hans Island is meaningless for peoples who use the land, sea, ice and wind to live. Many of these Arctic placeness discussions are characterised by islands and archipelagos including the Aleutians, Hans Island, Greenland, Iceland and Svalbard. Nunavut’s capital sits on Baffin Island rather than the mainland. Many of Norway’s principal Arctic settlements are on islands including Tromsø, Harstad and Hammerfest. Island studies has evolved over the past generation, exploring the natures and personalities of islands, island communities and islanders. Much debate and critique has centred around what it means to be an island or an islander, defining and examining the essence of islandness. These and similar questions and explorations have emerged for the Arctic, Arctic communities and Arctic peoples. Thus, we generate and query the term Arcticness through the chapters in this book. I’m intrigued about your pathway into this topic. Well it converged from two directions. I’ve been an allotment holder for 15 years, experimenting with a low-input, high-productivity method where you work alongside natural systems, not against them. That was a hobby, something I loved doing. Professionally, I was teaching international relations theory, which is a lot about how order can emerge from within a system itself. In the debate following my first book, The New Imperialism, I discovered general systems theory, which tries to identify what’s common to all systems: they have a capacity to self-regulate, but they can also go haywire. So I began to understand that the ecological problem and the threats to human society are not two separate challenges which just happen to face us simultaneously; rather, we can study them – and look for answers – in an integrated way. I addressed this in my 2012 book The Entropy of Capitalism, but at that more general level it was easier to write convincingly about all the bad stuff that was happening, than about solutions! The only way to get to grips with positive solutions was to take a very concrete topic and run with it. With Sustainable Food Systems, this all came together. Together with my colleague Yves Cabannes I started teaching a Masters module on Urban Agriculture, and there were also a few small community food-related action research projects. This suggested a lot of ideas which I felt somehow needed to be written down. But the project implies an unusual form of knowledge, drawing on both natural and social sciences. While general systems theory was a help, I had to be respectful to the integrity of each specific discipline – soil science, anthropology etc. – even where I don’t have specialist training. To ensure the research was solid, I embraced the peer-review process at several levels. I started with a conference paper, delivered in Paris in 2012, and then split it into five journal articles and book chapters, all exploring different aspects of food-systems issues. While I received much important feedback from the reviews on these papers, I was also myself doing quite a lot of peer-reviewing for journals. And I could trust the peer-review system for the quality of research in the leading scientific journals which I was citing. At the same time, the ‘new paradigm’, also implies deeper issues of fundamental world view. In this sense, knowledge (or maybe we should say wisdom) should not be reduced to academic research. The traditional/indigenous spirituality doesn’t see a distinction between nature and society anyway, it understands that our minds are part of nature, and correctly sees farming as intrinsically rooted in the wider ecosystemic context. In this sense, visioning sustainable futures is also a return, to a more authentic way of apprehending the world and our place in it. Finally, the project implied a different publishing model. Though there were enquiries from conventional publishing, I quickly rejected this when I realised that the form of publication must reflect the content: the book is about emergent order, self-organisation, commons regimes, peer-to-peer, grassroots research … therefore it had to be open-access. I was delighted that UCL Press was thinking the same way. What’s your take on organic food? Are you advocating it? There are two issues here. First, from a consumer angle, of course there are dangers from pesticides or loss of nutrients, which are rightly emphasised, but at the end of the day you might just say mainstream agriculture successfully feeds the world and the risk of changing it is too great. So I would rather approach the question from the production angle: the main thing wrong with conventional farming is that it destroys the complex soil ecosystem and ultimately the soil itself, and therefore the risk of not changing it is too great. We have a window of opportunity while there’s still enough food around. That’s why the issue is urgent. Secondly, ‘organic’ can often seem a negative definition, i.e. we limit ourselves by renouncing chemicals, which makes it seem like we’re farming with one hand tied behind our back. I’d rather emphasise what we are opting into: a whole new world of biomimicry and self-organisation … that’s why I sometimes prefer a term like Natural Systems Agriculture. Besides, the problem isn’t just chemicals, but a lot of other stuff: excessive ploughing, monocropping … Much of this is about how we face risk, because natural systems spontaneously evolve in response to shocks, and become stronger in doing so. Surprise me with something unexpected you encountered in researching this book. When looking for cutting-edge examples of the new paradigm in action – learning from nature, self-assembly and self-healing, not trying to control systems too much – I found them in areas like industrial design and materials science; farming in contrast, which you might expect to be our interface with nature, is still horribly conservative and stuck in the old ways. Wonderful research is being done, about soil systems for example, but translating this into an innovative, high-productivity, totally biomimicked farming practice: that’s not yet the mainstream, it’s still very peripheral. The countryside is so heavily depleted by herbicides, pesticides and monocropping, that cities are potentially havens for nature to regenerate itself: this has been beautifully demonstrated by green roofs, for example, and is potentially very encouraging for a programme of greening the city. We might even pioneer the new paradigm here! The book has an optimistic vibe, because it’s about solutions, and as you’ve said, some elements of ‘paradigm shift’ already underway. So what’s blocking it? And in particular, how do you interpret the recent Right-wing nationalist backlash. In the book, I paraphrase a quote from Lenin, about the ruling system being dragged against its will into a new social order. The shift in world politics towards the nationalist Right shows the system digging its heels in, frantically resisting the implications which its very own development has unleashed. That’s the aspect internal to society. But then there’s the environmental context: climate – plus soil-degradation and species-loss – forms the backdrop to everything. So why is the nationalist Right addicted to climate denial? Because if we take climate seriously, we’d have to face up to the social conditions demanded by resilience: decentralised capacity, peer-to-peer networks, modularity, non-monetary exchange, commons regimes. These are all evident in today’s food-related social movements – seed-sharing for example. The issue is inevitably political: a new ‘order’ is a self-organised, emergent order. That’s what scares the ruling interests. I think it was always more about community autonomy. But in a deeper sense, I take your point: we must dare to be normative, not just describe a movement like food sovereignty, but discover what it should be. A lot about the ‘old’ food sovereignty was resisting the extreme neo-liberal agenda of ‘free’ trade and its disastrous implications for food, and that was all very necessary, but it was only a phase. In the book I try to place this in a much broader historical context. You have millennia of resistance against exploitative agrarian systems, then against colonialism and imperialism, then against the ‘Green Revolution’ of the Cold War; at an English level, there is an unbroken legacy: the peasants’ revolt, the Diggers of 1649, early 19th century Chartists, the Land and Freedom movement of the 1970s, and some inspiring contemporary stuff. If the ruling agenda is today shifting away from ‘free’ trade, the enduring issues of commons and land rights haven’t changed. At the same time, today’s food sovereignty must also face up to new challenges. What has gone haywire (in society and its relations with nature) has been a narrowing, homogenisation, simplification. Physically, this is seen in the shrinking variety of crops being cultivated, in the strains of each crop etc. ; socio-politically this is seen in intolerance, xenophopia, the narrowing of discourses. If that is permitted, we will have a system (in food, in society) which fractures and disintegrates in the face of shocks. So if we are to respond to this threat, I would say – prolonging the book’s argument – that if political liberalism has in a sense destroyed itself by hitching itself to economic neo-liberalism, then the good things which used to be (very imperfectly) identified with liberalism must be regenerated on a new basis: tolerance, pluralism, what I’d call a ‘new cosmopolitanism’ … in essence a diverse system which can produce innovation from anywhere and which – when it faces shocks – will get stronger. The movement over land and food can be a flagship for this. Today, the academic and science community is trying to resist the attacks of obscurantism, but can’t do this alone: it needs mass allies. This is precisely what the land/food-related struggles – of peasants, indigenous peoples, the urban masses – can supply; the academic world has important knowledge to offer, but it will also be itself transformed by discovering a new social relevance. In these ways, researching the book, I got some kind of glimpse of a new world coming into being. It’s exciting to feel part of this. 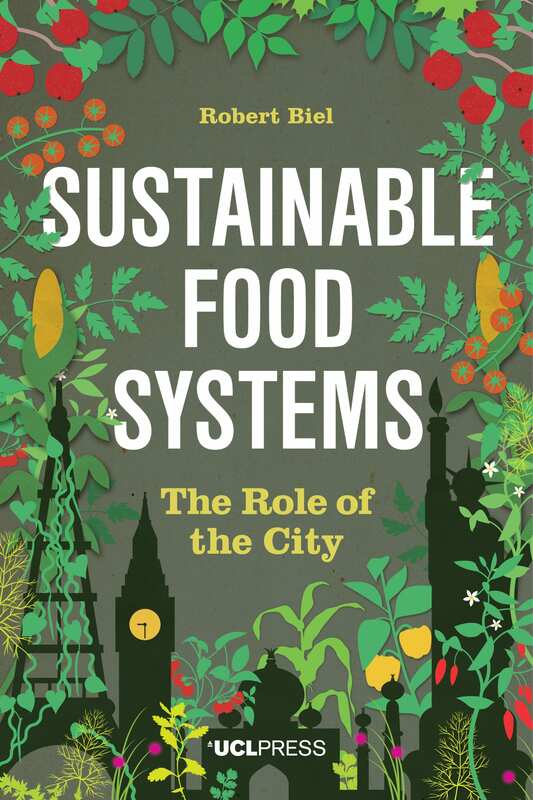 Sustainable Food Systems: The Role of the City is available to download for free here. Suburban Urbanities is an edited collection that is the culmination of over seven years’ research into the urban form and social logic of metropolitan suburbs. The research considered the factors that contribute to the long-term success of suburban town centres. In order to do this we studied a century’s morphological evolution and land use patterns of twenty outer London suburbs as well as, more generally, how cities grow and take shape over time. The research took a multi-disciplinary approach, integrating urban analysis (using space syntax) with ethnographic studies of people, organisations and places on the one hand, and historical studies of land uses and urban form on the other. Towards the end of our project we sought out a comparative set of examples from the UK and elsewhere around Europe and the Mediterranean. The book takes these examples and organises these into three themes: Suburban Centralities – which has a focus on city-wide transformations, showing that local places are shaped and formed over time according to their accessibility to long-term patterns of human, social and economic networks of activity across scales; High Street Diversity – which has a focus on the high street, the active centre of urban and suburban centres. The last section of the book is called ‘Everyday Sociability’. In addition to the case studies themselves, the book has a clear agenda, to challenge the perception that urbanity only exists in the city. Opening with a pair of theoretical position pieces, it argues that urbanity exists in a continuum from urban to suburban. When discussing suburban life it is vital to get away from the binary choice between suburban versus urbane. Indeed, we are all suburbanites in one way or another, given that urbanism is a temporal process. As an early adopter of open access through UCL’s repository, UCL Press seemed like an ideal choice for Suburban Urbanities, given that it is a university press dedicated to full open access. A surprising bonus has been the fast turnaround, from submission in April 2015 to publication in November 2015. At the same time the visual and material quality of both online and print version is excellent – indeed, one of the book’s reviewers commented that it is “a book that looks and feels beautiful”. Most important for me has been the immediate impact of the book. Alongside its thousands of downloads (3750 at last count) in eighty eight countries, it has had impact in all sorts of unexpected places: featuring in The Atlantic in its CityLab blog and an activist in New Zealand has been tweeting excerpts of the book at his local planning authority to raise various policy issues. My hope is that it will continue to resonate far and wide as we continue to battle with the complexity of suburban urbanity in future years. 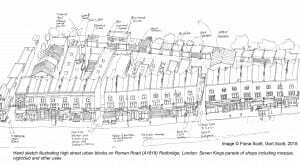 Laura Vaughan is Professor of Urban Form and Society at the Space Syntax Laboratory, Bartlett School of Architecture, UCL, and editor of Suburban Urbanities. In addition to her longstanding research into London’s suburban evolution, she has written on many other critical aspects of urbanism today. Follow her on Twitter at @urban_formation.